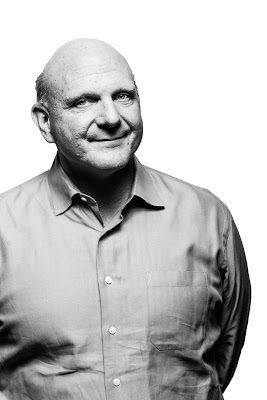 Small Biz Thoughts by Karl W. Palachuk: Steve Ballmer Resigns - Good or Bad for Small Business? Steve Ballmer Resigns - Good or Bad for Small Business? Steve Ballmer, CEO of Microsoft since 2000, has announced that he'll be stepping down in the next year. A search committee has been formed. Microsoft's stock soared 7.5% on the news. Where Bill Gates was generally loved and had a Teflon coating when it came to criticism, Ballmer has more of a Velcro coating. Folks outside Microsoft quickly blame Ballmer for the decline of PC sales world wide as well as the lackluster reception of Office 2013, Windows 8, and the Surface. But who cares what others think: Is Ballmer's exit good or bad for small businesses? In my opinion it is good. I've never met the man and I have nothing against him. Some people love to hate him. That's not where I'm coming from. But somehow in the last decade or so, Microsoft's focus has become un-focused from this outsider's perspective. I have mentioned for years that Microsoft "owns" the desktop. Their operating systems are on virtually every computer in the world! And their Office suite is on virtually every computer with a commercial office suite. But Microsoft seems to be giving up that market. I know we all need to go to the cloud. I'm actually a huge advocate of that. But Microsoft took a collection of products that I could make $200/desktop on and turned it into an offering that would take me 36 years to make $200 on. The result? I don't push their stuff any more. Like many small I.T. consultants, we removed the Microsoft logos from our business cards. We didn't renew our certified partnership after ten years. People like me and you make decisions based on OUR bottom line. I can't afford to write off $900 million because I created a product and then messed up the marketing and sales of that product. We have to make profitable decisions for our businesses, and for our clients. Microsoft has moved away from the partner-centric model that got them where they are. They are paying the price for that with Windows 8 and the Surface. If Microsoft had 300,000 partners able to sell the Surface, they would be back-ordered right now. Instead, they're being given away in lieu of $5 Starbucks cards. Creating a new team at the top of Microsoft has to be good for fresh ideas, fresh focus, and taking stock of what has really worked for the company. Competing against your biggest hardware "partners" and all of your channel "partners" is just bad policy. With luck, the new leadership will take that to heart. Having given away the desktop, Microsoft now has to focus on what they CAN do to own the small business market. That's good for all small businesses. That means a renewed effort to innovate, create, and combine technologies that will make us all more productive. Good innovation also makes people happy because we use technology for pleasure as well as work. Microsoft has the money to create amazing innovations that can change our lives. They hold a lot of promise for humanity. That's not an exaggeration. But it would be a horrible shame if a company with such potential floundered about for another decade. Microsoft is one of the most (perhaps the most) important companies in the world. They need strong, forward looking leadership. I am looking forward to it. And finding someone who's a lot less angry wouldn't hurt either. Microsoft has embarked on a campaign designed to shove what it wants at its customers. If it would simply let customers choose what they want, life would be much better for Microsoft. If they prefer Windows 7, let them buy it. If they prefer Office 2010, let them buy it. It's all revenue to Microsoft. Instead they insist on imposing their will on the marketplace and that is a huge reason for its current unpopularity. At the same time, I agree that they have abandoned all but the top 3% of its partner base, which generates 90% of its partner revenue. As a result, partners are actively seeking Microsoft alternatives in almost every product category. None of this is unpredictable. It's been done before by other companies and you can read about the results in the case studies used at Harvard Business School. My hope is that new leadership at Microsoft will have the ability to see and understand the value of having an engaged and broadly-based partner ecosystem once again. I totally agree with your assessment Karl. As the CEO of IT Squared, I hate the fact that our team (sales and techs) have to invest a lot of time learning Office 365 in order to resell it as a MS Partner to our clients and not getting the proper partner support from Microsoft. Not to mention the tiny business margins we get for all of our work. It's a given that MSP's like us have to invest time in learning new tech products, but I think Microsoft has forgotten us. We get more support and attention from our BDR partners than anyone else. Yes, Microsoft needs a new leader that can put the mess of puzzle pieces together to get the company back to one and move forward. It will be interesting to see how their competitors will react to this change. I'm looking forward to the future. Is Microsoft "too big to fail?' Probably. This was certainly the attitude I experienced when trying to get support to migrate my Office suite from one laptop to the next generation etc. If you look at how big and cumbersome both HP and Dell are and the two companies that provided all the Microsoft support when there is another reason for their unpopularity. Does Microsoft care about their customers - not from my perspective. Neither does Google or Yahoo - ever tried to get any email support or call center support let alone find a number to phone somebody? To make Microsoft relevant its time to break up its business units so they can get back to looking after their customers - at all levels. Yes, Microsoft seems to be following the Dell playbook by forsaking it's business partners. As an example - We use the Microsoft Surface Pro as our daily driver for our staff and while we LOVE the device and have standardized on it, we watched in horror as Microsoft made a complete mess of the launch and failed to use it's most powerful marketing tool (us Microsoft Partners) in order to insure it's success. They could have & should have given us DEEP discounts on the Surface Pro so that we were seen and heard everywhere with this flagship device in our hands. See, WE control opinion at our client's workplaces. People regularly ask us for advice on what to buy. Instead,we found ourselves on equal footing with the common consumer for that ill-fated February launch that only failed more in procurement and delivery than it did in marketing. I sat there at my local Best Buy that morning looking in disbelief as the Surface Pro tablet I had ordered a month prior was not "in store and ready for pickup" on the morning of the launch. How ridiculous is that for THE technology company when Apple seems to get this "product launch" thing right every time? Embarrassing thing for us "beloved" Microsoft Partners. They failed even further with the Surface RT launch, failing to do the marketing that they are just now doing showing that device as their "iPad competitor" and pointing out the differences side-by-side... Including the "duh" bullet point of FINALLY pointing out that the Surface RT includes "OFFICE 2013 Home and Student" (And also Outlook, now... Finally). What a horrible job of defining who your product should relate too and what sets it apart from it's competition! Embarrassing treatment of a device that, properly marketed to College Students, High School Students, and parents of those groups (even the small business user can get away with using that device as their daily driver... Assuming that they don't need installed software and can survive on "apps + cloud". Back to the Surface Pro, if I had a nickel for every time some stranger has asked "Is that like an iPad"... I wouldn't be a millionaire but I'd need an industrial coin counter. While I do my best to educate them by saying "This is a real full blown laptop that can run AutoCad and PhotoShop and also can run apps" and then show off the USB 3 port and power supply and such-- the fact that Microsoft failed so badly on the marketing front for both Surface Pro and Surface RT means that such "trainings" are now necessary. We are dealing with a Microsoft that makes THE superior product offerings to every one of their competitors, but their failure to leverage the Microsoft Partner network means that they are failing miserably on the marketing front. Embarrassing. Windows Phone is case-in-point. I've used it since the days of Windows Mobile and Windows Phone 8 is simple, beautiful, and very marketable... If only they would put the devices in every Microsoft Partner's hands for a deep discount or for free. If only. Rinse, wash, repeat. Frustrating. The Nokia acquisition certainly shows where Ballmer wants to go - and his willingness to invest huge amounts of money to make something successful even when it has proven to be unsuccessful for years and years.